How about something easy? This is about as easy as it gets, and it is one of the most popular meals in our house: Sous Vide Duck Breast. It does take some special equipment: a vacuum sealer and sous vide machine. Is it worth it? YES. You can use any type of duck breast for this. I am a big fan of Hudson Valley Fois Gras as a source for duck meat, but any duck will do. Find a source you like. They normally come as 4 pieces per pack frozen. I try to keep some in the freezer at all times. To prepare, lay the breasts out on a plate and sprinkle with a bit of sea salt. Next, liberally rub with Asian Five Spice powder. Making your own with freshly toasted whole spices is the best, but you can use fresh pre-made powder, too. Seal two breasts per pouch. I have the VacMaster VP112 model chamber vac. 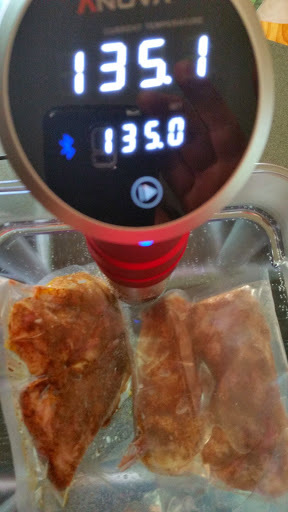 Get the sous vide heating to 135F. 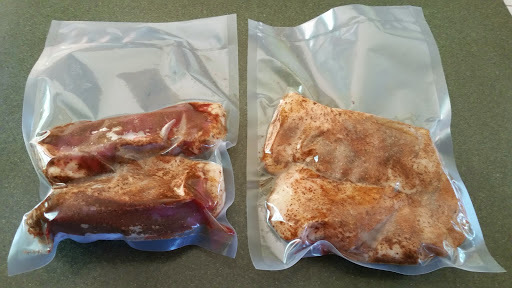 Once it is up to temp, drop in the sealed pouches of rubbed duck, and let it go for at least 2 hours. I use the Anova Precision Cooker. Remove the duck from the pouches. The duck is fully cooked; it just needs to be seared. Heat a cast iron skillet to searing temperature. Score the fatty side of the duck (skin). Place the duck skin side down in the pan. Sear until fat is rendered and the skin is brown and crispy. Flip the duck to sear the meaty side. Remove from pan (reserve rendered fat for tomorrow morning’s breakfast potatoes). Rest the meat and then slice ¼ to ½ thick. 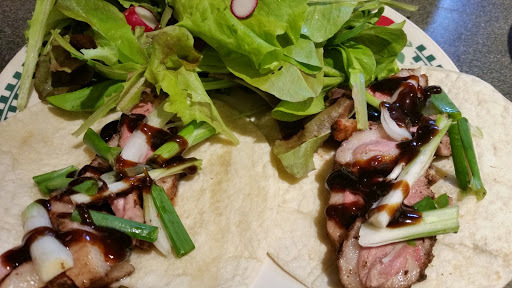 Place a few slices of duck on a warmed taco size flour tortilla. Drizzle with hoisin sauce and garnish with some julienned spring onions. A side salad and maybe steamed rice….easy! 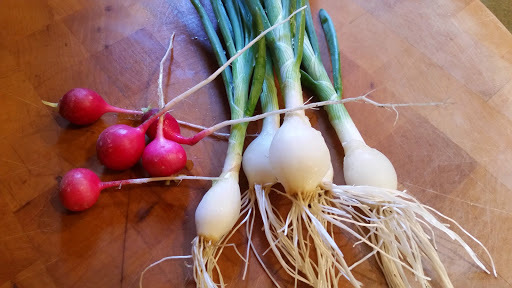 Spring Onions and Radishes fresh from the Garden!